An advertisement for the mosaic tile work on the indoor pool at 'Pembroke', the Joseph R. De Lamar estate designed by C.P.H. Gilbert c. 1916 in Glen Cove. Click HERE for more on 'Pembroke'. 2 days now, silence again from up north? The CPH festival rolls along. Will we re-visit Muedon to end the week? Yes that pool, the ironwork, the tea house, the 2 story scale of the structure and the mosaic work featured surely put the conservatory into the over the top category. Amazing. Extravagant, over-the-top space, but certainly not vulgar. 2) How much do we think Gilbert's firm was paid for their work on this house? In justification of his appraisal, Thomas E. Kirby of the American Art Association said that many of the articles owned by Captain De Lemarr were showy and required a large house for a proper setting. The present tendency of persons who can afford valuable art objects just as those owned by Captain De Lamarr is to live in apartments where they are unable to house such tapestries, paintings, antique furniture and statuary, and the demand for them is diminished. Unfortunately those other indoor pools dont come with an iron bridge, garden grotto and a tea house, but they try. I didnt know the Hearst pool inspired a Dallas Texas knock off(the Volks pool)? And Alice? What do kids know? Supposedly (and I am not quoting exactly) Consuelo Vanderbilt also detested her home on 5th Avenue saying it was cold and that she hated going up to bed at night since she had to climb the towering, curving staircase and it grew darker as she went up frightening her as a child. Yea, we all should be so unfortunate as kids. 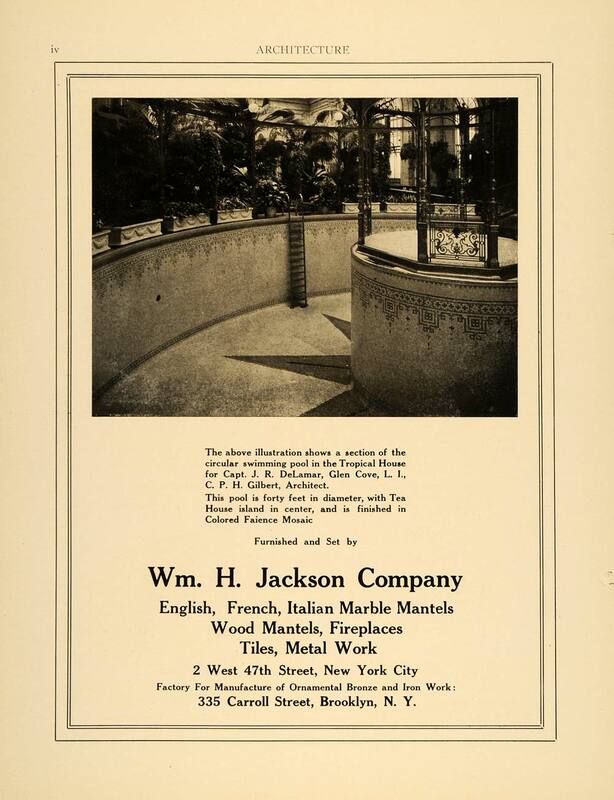 By the by- the William H. Jackson Company is still very much in existence, and although I can't comment on the current quality of their mosaic work, or even if they still undertake such things, they make the world's best fireplace screens that roll up into a casing at the top of the firebox, completely out of view when not in use. Pricey, yes, but worth every penny to my mind. Wm. H. Jackson does, indeed, still exist. When I moved to NYC about 15 years ago I went to them in search of a good fireplace screen. As you will see by the link to their website, their selection is first rate and verrrry expensive. I ended up getting my screen elsewhere!